Business and Finance courses still available at Glasgow Clyde College across our Anniesland, Cardonald and Langside campuses. The courses range from SCQF Level 4 through to Level 8 (HND). Year in Industry (YINI) have placements in architecture, engineering, mainly electrical and mechanical, business, finance/accountancy in multiple roles in Scotland http://www.etrust.org.uk/year-industry/vacancies/vacancies—scotland and many more UK wide. *Registrations to YINI close on 31st May 2019. The Year in Industry (YINI) placements offer students the opportunity to gain professional development by working at a reputable company. 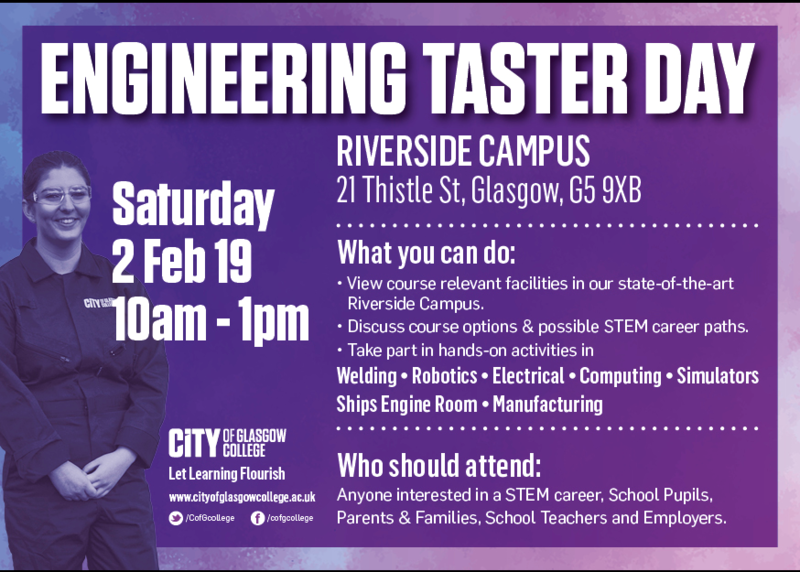 They help place students in top UK companies and organisations every year, including, Rolls-Royce, EDF Energy, Scotrail, ScottishPower, Leonardo, Schneider, Syngenta, P&G plus many more. Typically, the programme lasts for 12 months and comes with a good salary. Pupils don’t have to have filled in a UCAS application to join either but they do need to be sitting their Highers/Advanced Highers or equivalent. Some pupils stay on with the companies and take up their advanced apprenticeships. A number of students are sponsored through university each year and many of our partner companies see The Year in Industry as an important part of their graduate/employee recruitment programme. A Year in Industry placement can fast track a student’s future career, greatly improving employment prospects. 97% of students who have undertaken a Year in Industry feel they are more employable, as it adds massive value to a CV as well as greatly increasing confidence and maturity levels. Be expected to undertake a challenging job, which will both be stretching and relevant for your future studies and career path. http://www.etrust.org.uk/information-students – see video links in this section. Innovator. Disruptor. Trailblazer. There’s more to become. You’ve got the drive. The ideas. Now it’s time to put it all to use — while learning from industry-leading experts and taking on new challenges. We’ve recently launched our Foundation and Higher Apprenticeship opportunities in our Operations and Technology business areas. Here’s everything you need to know about them. Every minute of every day, Barclays is a hive of activity — from a couple getting their first mortgage to a business receiving a crucial loan. Operations are behind it all, using data to ensure each transaction, payment and trade is processed effortlessly. Our Technology teams keep us ahead of the curve — developing innovative technologies that shake up our industry. Apprenticeships at Barclays enable you to take on a fulfilling role, earn a salary, and gain new qualification — all with our support behind you. Whichever team you’re interested in, you’ll be part of a structured development program — one that gives you everything you need to start building a rewarding career at a world-class bank. You’ll benefit from focused on-the-job training, challenging work, a strong team-focused working culture and the opportunity to drive and take ownership of your career. All of this coupled with a Foundation Apprentice Qualification or Higher Apprentice Degree. Once your Apprenticeship’s complete, you’ll stay part of the team to develop your career further. Do you want to join the next generation of legal talent? Build your career at CMS, the future-facing law firm. Our six-year Level 7 Solicitor Apprenticeship Programme opens the door for a new generation of talent to join our award-winning firm. Based in London, Manchester or Bristol, you’ll earn a salary whilst studying for a law degree and gain the knowledge, experience and wider skills to develop your career as a solicitor. Year 13 students – for opportunities to commence a solicitor apprenticeship in September 2019, visit cmsearlytalent.com for more information and to apply. Deadline for applications is Tuesday 23 April 2019. Year 11 & 12 students – for opportunities to attend an information evening to find out about solicitor apprenticeships in subsequent years, visit cmsearlytalent.com. Argyle Consulting Limited is one of Scotland’s largest independent financial consultancies, helping our clients to plan for their future, their families and their businesses. We are currently looking to recruit a Trainee Administrator in our busy city centre Glasgow office. This is an opportunity for a suitable candidate to enter the financial services industry, learn new skills and develop knowledge, opening up several avenues of career progression in the longer term. The key purpose of the role is to provide administration support to colleagues, ensuring we deliver a first-class service to our Clients. As Investors in People Platinum, full training and support in every area will be provided. This is the application form for Medic Insight Glasgow’s 2019 Week Programme for s5 pupils, running the weeks beginning 17th and 24th of June. Applications close at 5pm on Sunday 17th March. Please fill in all areas as honestly as you can and to the best of your abilities. Only one response is allowed per person. Be sure to check your answers are complete before you click submit. Plagiarism is not tolerated and will automatically exclude your application from consideration. All sections marked with an asterisk must be completed; if this is not possible, write “n/a” and provide a reason for this in the last section of this form. Applications close at 5pm on Sunday 17th March – no exceptions will be made. Brodies LLP is a founding member of PRIME, a pioneering initiative by the UK’s leading law firms to encourage greater diversity in the legal profession by offering quality work experience and continuing support to young people from less privileged backgrounds. We are committed each year to offering students aged 13-17 the opportunity to take part in a structured work experience programme that is co-ordinated and delivered by Brodies staff representing departments across our business. The programme delivers a minimum of 30–35 hours of work experience and is designed to give the young people involved an insight into all aspects of our business, not just law but also our professional support services, such as IT, Finance, HR and Marketing. We would like to extend an invite out to your 4th year and 5th year students who may be looking to study law at university. Students applying must be entitled to free school meals OR be the first in their family to go to university. The Glasgow week will be held in our 110 Queen Street office and will take place on Monday 24 June to Friday 28 June. For pupils 15yrs+ / S4 & up who are serious about becoming a professional dancer, choreographer or dance teacher. 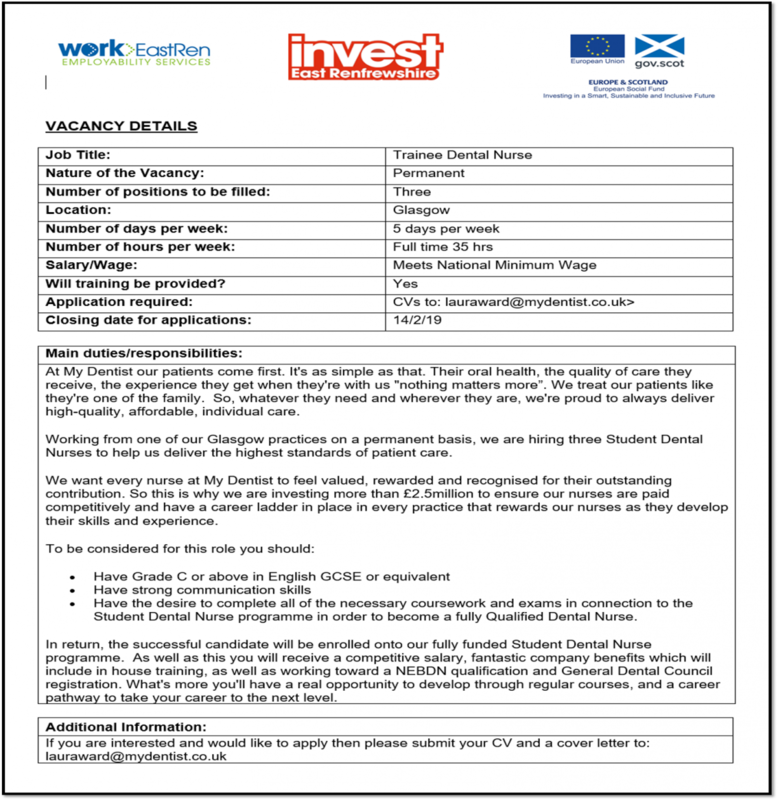 Westlea Care Home, Neilston are currently recruiting for a part-time Office Administrator. We are looking for a conscientious, honest, reliable person who understands the importance of confidentiality. You will be predominately office based and will be required to work 2 days per week – Mondays and Fridays from 9am to 5pm. Tony Mann’s Barber Shop, Giffnock has an immediate start for an experienced fully qualified Barber for their busy shop. Applicants must have experience working within a barbershop and will be required to cover all aspects of barber work from old to new styles. Full time hours available for the right candidate on a self-employed basis. Westlea Care Home, Neilston are currently recruiting for a Kitchen Assistant. Your duties are to assist the cook and provide nutritious meals under hygienic conditions and to be aware of and act at all times in accordance with current food laws and regulations. All employees are bound by Company Rules and the Residents Charter which are detailed in separate documents. To assist the cook to prepare and serve meals as required. To be responsible for the clearing of tables, washing up after meals, the overall cleaning of the kitchen and, where appropriate, the dining area. To maintain health and safety regulations and full compliance with other statutory requirements in the kitchen area including the hygienic disposal of food waste. To undertake such other duties within the general areas of the kitchen that may be reasonably required from time to time (these other duties will be allocated by the Home Manager on the basis of the hours worked, as stated in the Terms of Conditions of Service of the Employee). Adcal Dental Lab is a Dental Laboratory based in Barrhead. We are currently looking to employ a full time trainee Dental Lab Assistant to join our small team. Exciting opportunities are available in our Glasgow office for 5th and 6th year school leavers to join our JC Futures School Leavers Programme and just wanted to remind you that the closing date for applications is Thursday 14th March 2019. Our training programme is suitable for pupils who feel that university is not for them and would like to gain practical experience while they learn, earn and work towards a professional qualification. Working with our Audit or Tax teams, the successful candidates will be provided with training and support in basic accountancy skills in their first year, therefore a Higher Accounting qualification is not required. Candidates should have achieved or be aiming to achieve 135 UCAS which may equate to 5 Highers (or equivalent) over 1 or 2 years. Any pupil interested in applying should send their CV and a cover letter to studentrecruitment@jcca.co.uk by the closing date. Foundation Apprenticeships boosts youth employability. The Step In, Step Up programme is an introductory one-day programme designed for female S4-S6 students. The day will give an oversight into the different technology programmes Morgan Stanley offers, as well as giving participants the opportunity to partake in interactive challenges, panel sessions and career workshops. Eligible pupils can apply for the programme here. Want to Learn More About Foundation Apprenticeships? On behalf of Glasgow’s regional colleges; Glasgow Kelvin College will be hosting an event at The Glasgow Film Theatre during Scottish Apprenticeship Week. “Skills for the Future – The Importance of Apprenticeships” The focus of this event is to raise the awareness of Foundation Apprenticeships (FAs) and the journey of our students through their FA. Following on from the national campaign by Skills Development Scotland, we welcome along any employer, parent, school teacher or pupil who wants to know more about Foundation Apprenticeships. The event will give key information and a guide to Foundation Apprenticeships. We will also have current employers and students there on the day to give an insight into their FA experience. For parents and pupils attending we will also give you an understanding of where an FA can lead to once successfully completed. As an employer you will gain an understanding of how taking on an FA will benefit your business. Our Apprenticeship programme runs across a range of engineering specialisms including Track, Electrification & Plant, Signalling, Telecoms and Overhead Line. During your first 21 weeks you’ll be living and learning at Network Rail’s training centre in the Midlands. For the remainder of the 3 year programme you will work out of your local depot. In your first 21 weeks you’ll be one of 150 apprentices living and learning at Westwood, our world-class training facility. You’ll take on academic study at the same time as working and complete a series of work-based learning assignments and reports. There’s lots to take in and a lot of responsibility to take on, but by the end of the scheme, you’ll be set up for a great future and career at Network Rail. • You need to be a good team player, enthusiastic and have a drive to succeed. Candidates need to be 18 on or before the 29 September 2019. This is because all apprentices will be required trackside from the outset of their training programme, ensuring we are compliant with Health & Safety requirements and regulations around shift patterns and working at night for under-18s. There is no upper age limit, our oldest apprentice was 37. Clyde Marine Training are a Merchant Navy Training provider offering a variety of opportunities to students to train as either a Deck, Engine or Electro Technical officer. The Lawscot Foundation – invitation for prospective law students to apply for an annual bursary and mentoring support. They aim to support at least eight students in 2019 by providing them with a bursary package of £2,500 per year during their studies, and a solicitor mentor to assist with careers advice. The closing date for applications is 24 May 2019. – Is your parental /guardian total annual income under £34,000 and /or do your circumstances mean you would be unable to attend university due to your financial situation? (This can include receiving EMA, free school meals, being in care or being a young carer). Mactaggart & Mickel are recruiting apprentices for an August 2019 start at Mactaggart & Mickel Homes Ltd. 2 Painters based in the Central and West of Scotland. Joiner based in the East of Scotland. Are you interested in becoming a Quantity Surveyor? The following apprenticeship opportunity is now available on line. A four year Graduate Level Apprenticeship in Construction and the Built environment at Edinburgh Napier University, studying Quantity Surveying, whilst working with BAM Construction. Applications are now open and will close at 5pm on Thursday 28 February. Pupils must apply via the Sutton Trust website at: summerschools.suttontrust.com . Associate Deans will be on hand for the other engineering disciplines. It is open to anyone who wants to come in and see what is on offer. HSBC Work Experience opportunities that are now open for applications. The HSBC Work Experience Programme is designed to encourage students from different social-economic backgrounds to find out about banking with a view of joining HSBC either after university of after school through the apprenticeship or undergraduate programmes. Please be informed that you have to scroll down when you open the link – all work experience placements are at the bottom of the page. There is no need to filter the search. Our placements will be spread out across the UK and students can list their location preferences when applying, but please note that we cannot make any guarantees on placing a student in their preferred location as this is subject to availability. All applications should be submitted before the deadline of 10th February 2019. As places will be limited, we will be offering placements on a rolling basis, therefore students should apply early to avoid disappointment. Our Career Advisors from Skills Development Scotland will be present at the S5/6 parent’s night on Thursday 31st January. 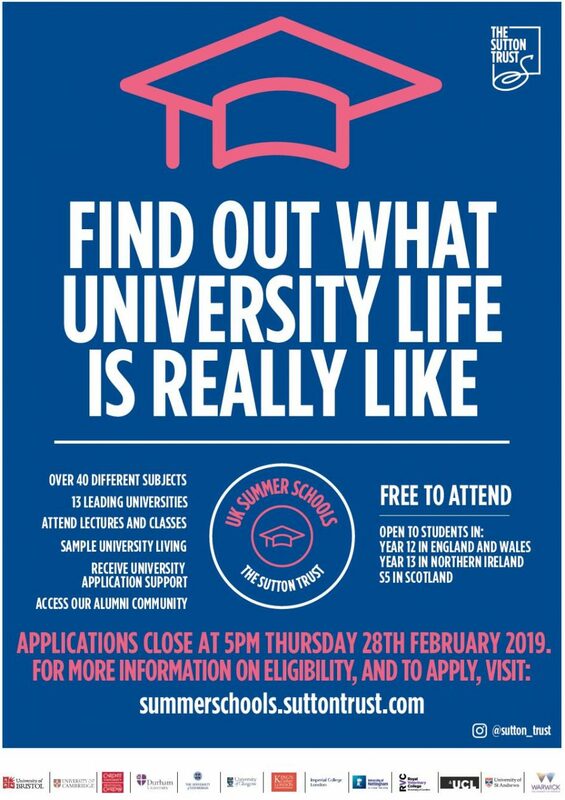 This is an excellent opportunity for pupils to get further advice regarding career opportunities prior to selecting their subjects for 6th year or leaving school. No appointments are necessary. The Career Advisors will be in the pastoral base throughout the evening. 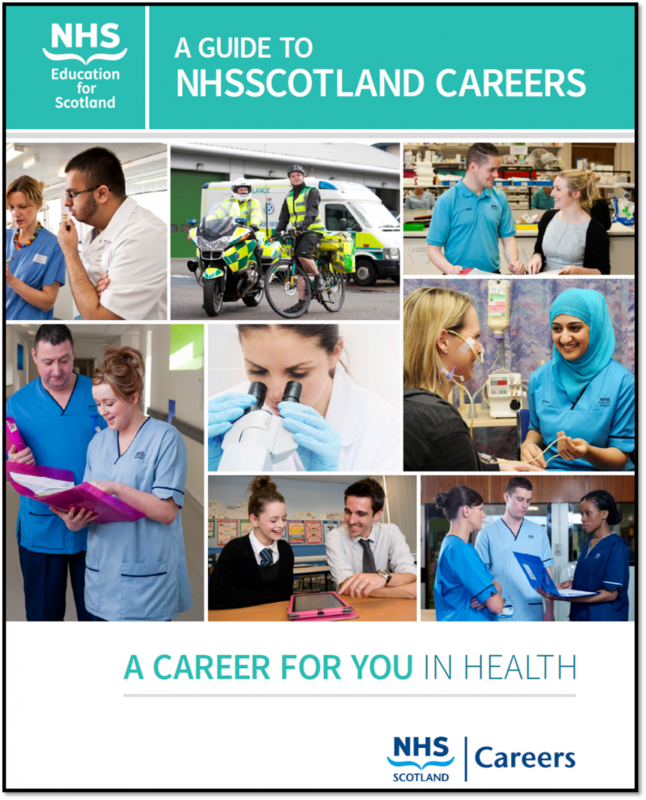 NHS Scotland have developed a booklet providing information about entry requirements, skills, values and much more for each job role. The job family leaflet shows all NHSScotland job families ‘at a glance’. 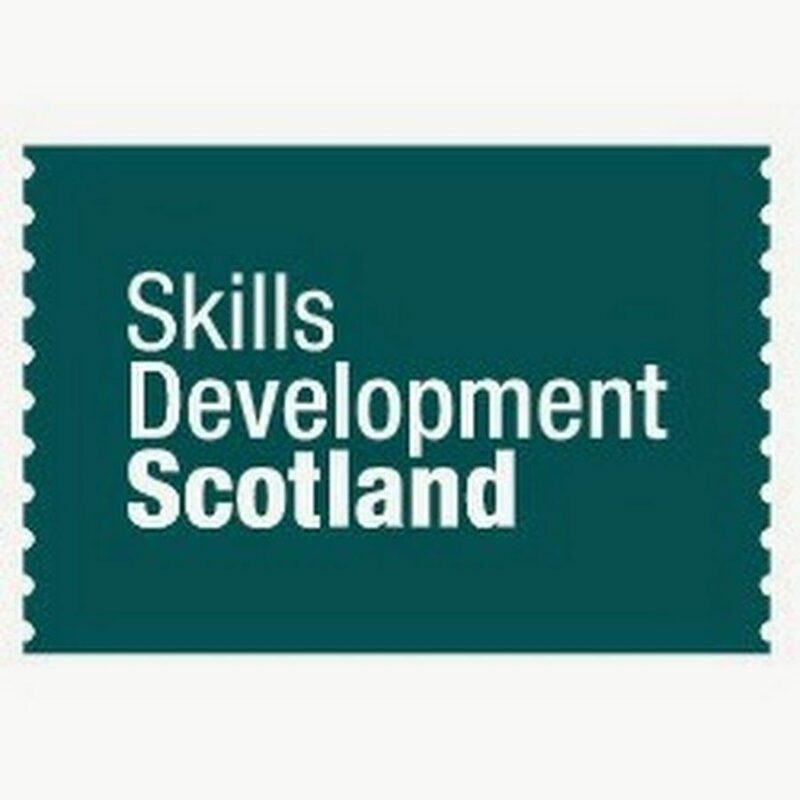 Skills Development Scotland (SDS) has launched a new website to help parents and carers understand current and future jobs in demand, the routes into these jobs, and tips on having career conversations at the times that matter. The 2019 Scottish Space School @ Strathclyde residential summer school will be held at the University of Strathclyde from 9-14 June 2019 and applications are now being invited via the online application system. Now in its 16th year at the University, the Scottish Space School continues to inspire the next generation of engineers and scientists and is aimed at S5 pupils in Scotland currently studying Maths and Science subjects at Higher level. Pupils should speak to their Pastoral support teacher for a reference. Pupils interested in studying at the University of Oxford (2020 entry) should consider the UNIQ access programme and discuss this with your pastoral support teacher. UNIQ is a free programme which gives students an opportunity to study at Oxford, meet tutors, sample their chosen course, stay in a college and learn how to make a strong application. Visit their website for further information regarding the different courses and how to apply. You don’t need a degree to start a successful career in business. If you’ve finished school and want to jump straight in, you can with an EY apprenticeship programme. Earn a salary from your very first day. Learn from inspirational colleagues on client projects. Do what you’re good at. Learn new skills. Get your professional qualifications before your uni-graduating peers – and go just as far. You’ll gain valuable, on-the-job experience with the opportunity to work with new tech and build the skills you need to get ahead. You’ll work with local, national and global clients from start-ups to big businesses whilst studying towards a professional qualification or degree. With development and support throughout, an EY apprenticeship offers you a great start to your career. So, if you’re looking for an alternative to university, start your career with EY. We’ll help you keep learning, evolving and building the future that’s right for you. The following programme has been created to provide theoretical knowledge and practical skills and experience to persons who are looking to secure an Electrical Installation Apprenticeship. The course comprises of a number of theoretical units and practical projects that have been associated with what would be included in the apprenticeship scheme. This process is to ensure there is a relatively straightforward progression from the course onto an apprenticeship, having gained much of the knowledge and understanding of electrical principles and the necessary practical skills required to be applied by an apprentice electrician. The above programme is provided in association with the Scottish Electrical Charitable Training Trust (SECTT), who co-ordinate the electrical apprenticeship programme for, and on behalf of electrical contracting employers. Are you interested in finding out about the traditional degree programmes as well as degree apprenticeships? Are you interested in Renewable Energy and Sustainable Science? We are delighted to announce that Solent University is offering brand new Headstart Learn & Earn course in summer 2019! 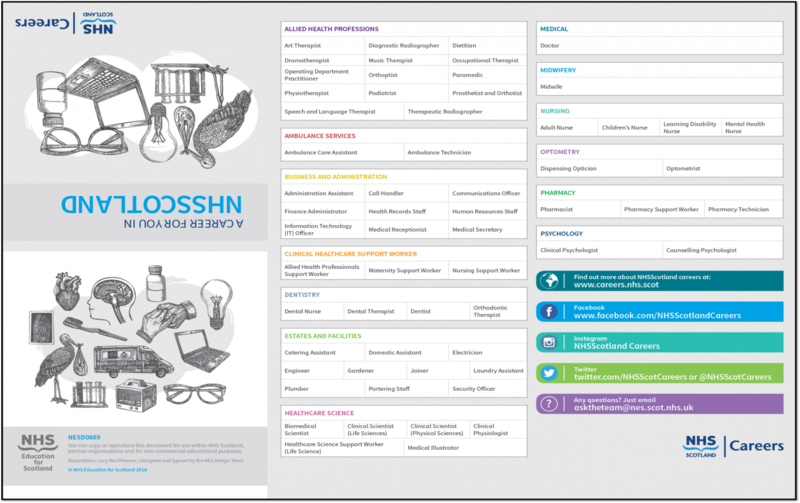 This new type of course will showcase subject specific information as well as apprenticeships on offer at Solent University. The course provides a fun and challenging introduction to a number of different types of engineering and highlighting the science, mathematics and technology concepts that are integral to each subject. Alongside the subject specific activities we will show you what it’s like to be in higher education and encourage you to problem solve, communicate and work as a team, all vital skills for education and work. The course is based on a challenge which you will be working on in a small team, you will initially be given some programming and workshop skills and you will be supported throughout the challenge with helpers who will offer advice and suggestions. Living in student halls and having academic sessions throughout the course will give you a taste of what it’s like to study at university. You will also participate in evening social activities. 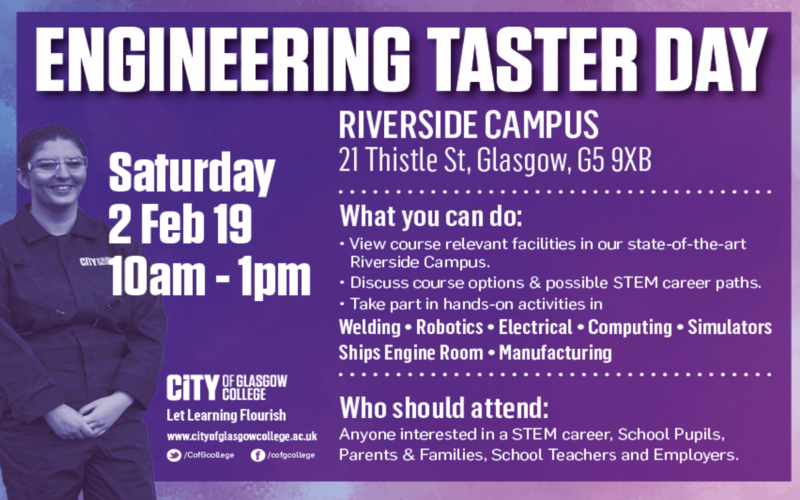 This course is suitable for students who are interested in either maths, physics, programming or technology and would like to apply their skills in a fun group challenge whilst learning about careers that might interest them. Primary Playcare Ltd provide Breakfast & After School clubs within the Giffnock area of East Renfrewshire. We are currently recruiting for Childcare Practitioners to join our Breakfast Club team working 7.30am – 9am Monday to Friday during school term time. We also have some hours available within the After School Club which operates from 2.30pm – 6pm Monday to Friday during school term time. Vacancy could be shared by more than one applicant. The successful applicant will be reliable, self-motivated, able to work well as part of a team but above all, have an interest in and an ability to interact with primary school aged children and their parents/carers. Ideally candidates will be interested in working towards SVQ Level 3 in Playwork/CCLD, HNC in Childcare or another childcare related qualification. • The preparation of food for the children attending the service and encouraging each child to eat a healthy breakfast each morning. • Contribute to the health, wellbeing, safety & security of each child in your care through Child Protection and Individual Care Plans. You may also have Key Worker responsibilities for up to 20 children. • You will follow the professional standards, policies and procedures as outlined by the Company, The Care Inspectorate and the SSSC (Scottish Social Services Council) to ensure that a quality service is maintained and offered. • Salary £7.98 – 8.75 per hour however we offer a payment enhancement for Breakfast Club employees for satisfactory attendance and punctuality. With this enhancement the candidate will receive an hourly rate equivalent to £10.64 – £11.66 per hour. If you are interested please forward your CV to ppc@primaryplaycare.co.uk or email us to request an Application Form. The programme is again being delivered in collaboration with the Weir Group – one of Scotland’s oldest and best-known global engineering companies, with a current workforce of 14,000. If you are applying please see Ms Kennedy or your Pastoral teacher. The Cutting Room Hair Salon in Newton Mearns are looking to recruit a full time Hairdressing Apprentice to assist their experienced stylist in all aspects of the work that they do which can include: colouring, cutting or styling hair. In most cases they will be assisting but for more experienced apprentices or those that show promise the stylist will allow them to administer treatment under their supervision. Are you looking for a Job, a Modern Apprenticeship or a Training Course? We are currently seeking applications for an Assistant Private Secretary within the Ministerial Private Office division based in Edinburgh. This is a permanent and pensionable appointment and new entrants will normally start on the minimum of the pay range. Candidates with a disability who meet the essential criteria below will be invited to the assessments. An Assistant Private Secretary (APS) provides a pivotal role within Private Office through the management of correspondence and diary schedules for Ministers and managing communication channels with the wider Scottish Government and with external stakeholders. This is a great opportunity to work at the centre of Government, gaining invaluable skills and experience. • Management of diary requests, including liaison with internal and external stakeholders on scheduling and prioritisation. • Management of meetings, including all relevant logistical support, commissioning briefing for Ministers. • Management of the Ministerial Database, processing of Ministerial Expenses, and management of purchases for the Private Office. • Management of Ministerial travel. There are a number of posts to be filled and we also plan to hold a 6 month reserve list for any future A4 APS roles that are identified within Ministerial Private Office during this period. Please note: Training will be given on various elements of the job to ensure the candidate is comfortable with performing the tasks expected. With this Apprenticeship, you can further your education, while working as an Apprentice Buyer within our team in Glasgow. “As an Apprentice Buyer you would report to the Regional Buyer and Supply Chain Manager, you will be required to work with our project and commercial teams by ensuring all materials and plant are provided to specification and programme for each job. Early careers talent is really important to us here at BAM. We’re looking for people with enthusiasm and initiative. You will love working in a team, learn quickly and have a passion for working in construction. You will complete a nationally recognised qualification and receive a competitive salary! You will gain valuable training in the workplace while being supported every step of the way, guided by a personal development plan. To apply click here Applications will close on the 6th of September! Based within Housing Services and the Business Support service, you will work within an office environment, gaining valuable experience whilst working towards a recognised qualification (SVQ Level 3). Applicants should have a genuine interest in administration work. An interest in understanding how a Council works would be an advantage although not essential. The Glasgow Window Cleaning Company, a family run company based in Newton Mearns is currently looking to recruit two Apprentice Window Cleaners to join their team. This is an exciting opportunity to join our team and receive training in all aspects of window cleaning. You will need to be physically fit and able to work at heights. You will be working in all weathers and have a good attitude towards work. All applicants should be well presented and have excellent timekeeping and attendance. A full UK driving licence would be desirable, but not essential. There are vacancies in the computing courses below. At IBM we also offer degree apprenticeship schemes, which allow students to study towards a Bachelor’s Honours degree and earn at the same time! Our employee benefits include: a company laptop, discounted cinema tickets, high-street store discounts and an Early Professional Manager to support career and personal development. Students can apply and register their interest here.